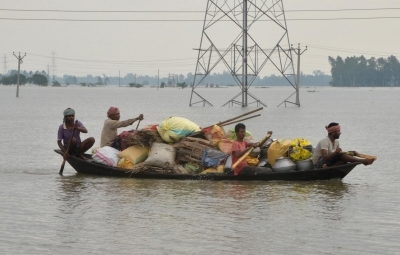 Kolkata, Aug 20 (IANS) The flood situation in northern West Bengal showed an overall improvement, barring Malda district where nearly five blocks were still inundated by the increasing water level of Mahananda river, the state government said on Sunday. “The flood situation in north Bengal is fast improving. However, the situation in Malda is still alarming as the water level of Mahananda is still on the rise. Five blocks in the district are submerged,” state Irrigation Minister Rajib Banerjee told IANS. “Heavy downpour in Nepal and Bihar is further worsening the situation as the water released by them is entering Mahananda. The water level is increasing by one centimetre every hour,” he added. “More than 43,000 cusecs of water has been released by the Teesta barrage today (on Sunday) which is also contributing to the increasing water level,” said an Irrigation Department official. “All the teachers in the region have come together putting aside their caste, creed and political differences and are cooking food for the flood victims. We are also supplying the food to the remote areas with the help of district administration,” said a member of a teacher’s association in Malda, now busy distributing relief materials.